Raisins are added to many of the dishes and are sweet to taste. Other than its use in cooking and in the treatment of gastrointestinal problems, it has a lot of other benefits also. They are much healthier than the regular snacks that you consume every day. Having a few raisins every day can work wonders on your general health and also provide you a young and glowing skin. Raisins protect the skin from getting damaged by free radicals and also prevent sagging of the skin. The collagen in them provides elasticity to the skin and reduces the signs of ageing. Raisins are rich in magnesium and potassium, which help in the curing of acidosis, a condition created due to blood toxicity. Acidosis increases the acidity in the body and leads to the formation of pimples, boils and psoriasis. So having raisins regularly help to keep your blood toxin free. The functioning of liver to detoxify the body is also enhanced by consuming raisins. By flushing out all the toxins from the body, you get a clear and healthy skin. Having raisins is an effective way to protect your skin from getting effected by the harmful rays of the sun. It forms a shield against damages by the sun and also prevents skin cancer. Raisins remove toxic and black cells from the blood and help in purifying the blood. This in turn provides you a clear, shiny and well-nourished skin. The antioxidants present in raisins prevent the degeneration of DNA of the skin and the Vitamins A and E in them make the skin young, supple and glowing. Raisins can promote hair growth, as they contain rich source of iron which helps in healthy blood circulation in your body and head scalp. They also help in fighting hair loss caused due to environmental issues as well. Including raisins in your daily diet is very good for your stomach. This is because raisins contain fibers which begin to swell up in presence of water. This provides a laxative effect to the stomach and prevents constipation. So have raisins daily for regular bowel movements. 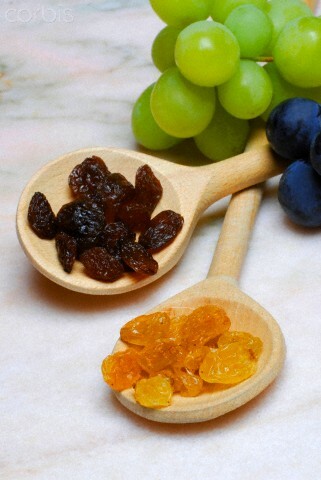 The fibers in the raisins help to throw away the harmful toxins and waste products from the body. Eyes are one of the most important parts of your body and having healthy eyes is very important. Raisins contain an antioxidant called polyphenolic phytonutrients, which helps in providing you a strong eye sight. The antioxidants in raisins protect the eyes from the harmful actions of the free radicals, which are responsible for the weakening of the vision, muscular degeneration and cataract. Other than the antioxidant, raisins also contain other substances that are excellent for the eyes like beta carotene, Vitamin A and A-carotenoid. So having raisins daily improves your vision as well as keep various eye problems at bay. Raisins protect your teeth from decay, cavities and as also prevent brittle teeth. This is because of the presence of a phytochemical known as Oleanolic acid in raisins. Raisins also keep a check on the growth of bacteria in the mouth because of its anti-infectional properties and keep the teeth from getting decayed. Calcium, which is necessary for good bones and teeth, is also found in good amounts in raisins, which keep the teeth safe from getting peeled away or breakage. The boron found in raisins keeps a check on the growth of the germs inside the mouth. For those who want to gain weight, having raisins regularly is one of the best options. This is because of the presence of glucose and fructose in high quantities in raisins. These substances provide you excess energy and also help you to gain weight. One of the benefits of consuming raisins to gain weight is that it increases you weight without causing an increase in the accumulation of bad cholesterol. Calcium is essential for healthy bones and teeth and for their proper growth. Raisins contain quite a good amount of calcium and therefore are good for your bones and teeth. It also protects you from arthritis and gout. Anemic people benefit a lot from consuming raisins because of the presence of iron and vitamin B-Complex in them. It also contains copper, which helps in the formation of red blood cells in the body. Having raisins regularly helps to prevent various types of cancer. This is because of the presence of an antioxidant called cateching in raisins. This protects the cells from the activities of free radicals, which cause tumors and colon cancer. A substance known as polyphenolic phytonutrients, which s found in raisins, have great anti-inflammatory and antioxidant properties. The anti-bacterial properties of this substance kill bacteria and reduce the risk of fever. In short, having a few raisins regularly will keep you away from cold, fever and other infections. It is proved that having raisins regularly are good for your sexual life also. The amino acid called Arginine contained in raisins increases libido and induces arousal. So it is beneficial for treating erectile dysfunction in men. Raisins also provide you extra energy, which is good for your sexual life. In India there is a tradition of giving the newly married couple a glass of milk to which raisins and saffron are added. This justifies the effectiveness of raisins in sexual life. Raisins contain good amounts of the minerals potassium and sodium. These minerals help in reducing acidity and also aid in the removal of toxins from the body system. Thus they prevent various diseases like arthritis, kidney stones, gout and heart diseases, keeping you fit and fine. With so many benefits of the raisins, you must make it a practice to have raisins regularly and it is sure to make you healthy and young looking.